Thursday is my official weigh in day and I have been on the Slimming World plan for one week now, I weighed in this morning and I have lost 3lbs! I’m over the moon with this weight loss because I have stuck to plan 100% and I’ve actually really enjoyed it. I’ve definitely become a stronger person in the past week being able to resist lots of naughty meals and treats my boys have had including Mc Donalds, a Wetherspoons fry up and lots of chocolate! They definitely put me to the test and in the past I would have probably given in despite trying to be good so I’m uber proud of myself and I’ve even managed to make myself some healthier alternatives so I didn’t feel like I was completely missing out. I’ve kept my food pretty basic this week just to make things easier for me but I have a few Slimming World recipe books that I’m going to take a good read of and attempt something new next week. My favourite meals this week were Spaghetti Bolognese, I could believe this meal was ‘free’ it was so delicious and my husband said it was yummy too which is a bonus! I’ve also just enjoyed simple salad dishes and jacket potatoes as I said I’ve been keeping things simple, I’m not the best cook but on this journey I hope to teach myself a few things. Meals aside it’s been all about the treats for me this week, it’s the part of the day I look forward to the most and always has been although in the past I’d usually make sure I have a bit of chocolate or biscuits with my tea, this week I’ve been mixing it up a little and I’ve found some amazing yummy treats. I was reading the Slimming world Magazine which is amazing by the way all of the foods listed in it even the advertisements lists how many points they are so when I saw the Lemon and Meringue Muller Corner I just knew I had to buy it in my next shop, my gosh this is absolutely delicious and only 2.5 Syns! 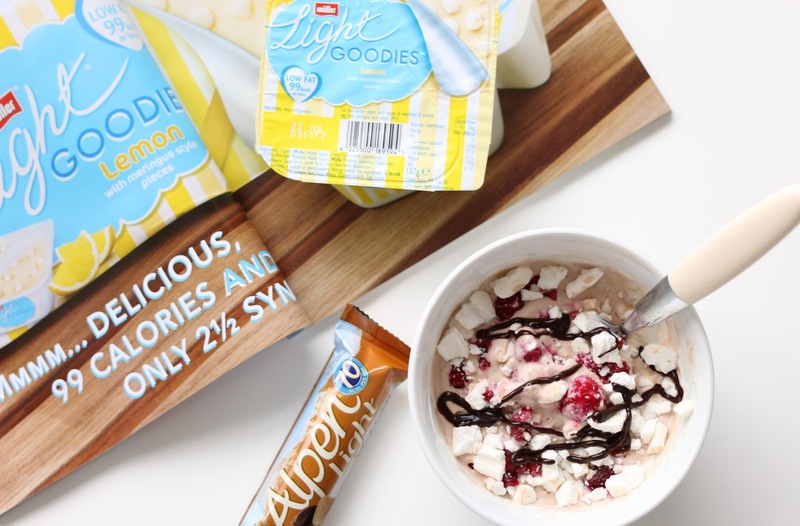 I’ve also been loving the Fudge and Chocolate Alpen Bar Lights these are only 3 Syns and finally Eton Mess! I have been making Eton Mess on the evenings I feel I really need a treat and this consists of; 1/2 a tub of Quark, 1 tsp Sweetener, 1/2 tsp Choc Shot, Raspberries, Strawberries and 1 Meringue crushed on top. My gosh it is a little bowl of heaven and it’s only 3 Syns! I can’t wait for weigh in next week already, I already feel so much better in my clothes and it’s only going to get better! Are you on the Slimming world plan? If so how did your weigh in go this week and what have your favourite meals and treats been?